Betsy's started her countdown of the Top Ten Picture Books of All Time with #100-91. I knew that as the list came out, I'd have many OH YEAH! moments where I recalled favorite picture books that I had somehow left off my list. There are so many excellent picture books out there and day by day my list might change, so the only way I knew how to make such a list was to sit down and bang it out! But how, oh, how could I have left Karma Wilson off the list completely??? * I'm sure others will pick up my slack, but Karma Wilson is one of my faaaavorites. So, to make up for my egregious error, I give you a post all about the Karma Wilson books that I love. Read them! Share them! And the next time someone asks for a list of our top picture books, would you remind me that I love Karma Wilson?! Bear Snores On - A classic in the making! While Bear is hibernating for the winter, all of his animal friends huddle in his cave to get out of the winter storm. As they feast and party, Bear snores on, until he's accidentally awakened and joins the party. This is a great fall book. It's got a simple, rhyming text and a repeated line that everyone can say together. 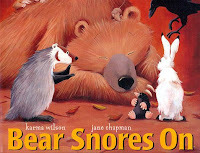 I love Jane Chapman's bright, friendly illustrations for all of the Bear books. Hilda Must Be Dancing - I love the bright, colorful illustrations by Suzanne Watts, and I love the bouncy, rhyming text with great vocabulary words. 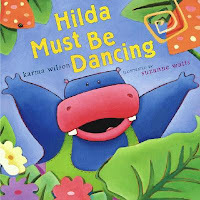 When Hilda the hippo is dancing, everyone in the jungle knows it because the ground shakes with her every leap! Although the animals try to introduce her to quieter hobbies, nothing satisfied Hilda until she discovers the quiet beauty of water ballet! 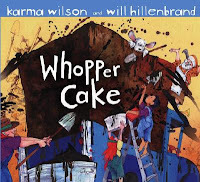 Whopper Cake - This is a great book for an early elementary audience (and works for preschoolers, too). Who doesn't love a book about making a giant cake! It's grandma's birthday and grandpa decides to make Whopper Cake. He doesn't use just two eggs; he uses dozens! The batter is so voluminous that it has to be stirred in the back of a pickup truck! This is one doozy of a cake and it just keeps getting bigger and bigger. YUM. Sakes Alike! A Cattle Drive - This one will go over better with kids who understand the word play on the phrase "cattle drive". The cows sneak the car keys out of the farmer's pocket and go joyriding. The police take up the chase, but when the cattle can't stop the car and go straight through town they inadvertently create a parade! Karma Wilson comes up with great rhymes that never feel strained. They're a pleasure to read aloud and her publishers pair her with great illustrators who provide beautiful, bright illustrations. 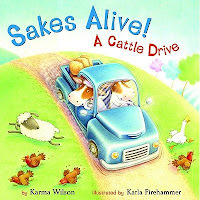 If you're looking for a book to spice up your storytime, give Karma Wilson a try! *I am pretty sure this will be the first of many posts and comments on Betsy's posts about how I failed at remembering all my favorite picture books and authors when composing my top ten list. So be prepared for that. I'm having a library design challenge. Stop by and visit to see what I'm doing in my library. I will be absolutely sure to remind you. :) Hee hee. And thank you for the honor. I love her book "Moose Tracks," it works perfect in storytime. Very cool that Karma Wilson commented on your blog entry! I LOVE Karma Wilson's books!! For our school-aged summer reading program a few years ago, I presented Moose Tracks as a live action/puppet presentation. It was so fun! I made an awesome moose costume and read the story through a microphone behind the puppet theater. We had puppets for all the other characters, we had fun props like a tiny mop for the mouse puppet, and we threw out things like feathers and nutshells wherever the story allowed. At the end of the story, I came from behind the theater and all the children were surprised to see the narrator was a MOOSE! Too fun!! Thank you, Karma, for such wonderful books that help Children's Librarians create beautiful connections with young readers!